Gold dinars are now being suggested by the Malaysian government as a means of exchange in the Arab countries. Although a gold dinar has been used during the seventh century by Islamic rulers, the coin has since stopped circulation and minting due to the common wars and other political and economic problems that those rulers incurred during their reign. But now, the use of the gold dinar is being proposed as a way of either ending the dependence of the Islamic world in the gold of European and Western countries and also to take some control in the global economy. It was in 2003 that the Malaysian Prime Minister proposed to create a gold dinar in order to boost the economy of the Arab countries and also to be a means of exchange for the trades that are done between Islamic nations. It will perhaps be a way of equalizing the differences between the various Arab currencies who in their own are experiencing some economic problems. So, with this in mind, the Arabs are now finding a way on how they can even out the problems that the Arab countries are now facing. It is not yet known which country would be producing the gold dinars and what they would weigh exactly but if they will be used as a contender for the gold bullion coins that are now being used and circulated in the world, then they would probably be at about one ounce being a standard unit of measure for bullion coins. Aside from that, they may try to catch up with the purity of the Canadian Maple which is pure gold. If the coin will be produced in Malaysia, then it will probably have a face value based on the Malaysian currency which is the Ringgit. According to some sources, it might probably be about the same weight that was used by the earlier versions of gold dinars which is about .12 of an ounce. If the idea will be carried out in the future, then the West will definitely have a tough competitor for the gold bullion market. Aside from the current leader, the Krugerrand, there will then be a lesser consumption from the Arab nations as they produce a gold coin of their own. Aside from the gold value of the coin, it will also even be used as a currency which will make it as a standard unit of trade in the Arab countries. There has been a push recently by some countries to stop dealing in the U.S dollar in exchange for buying and selling gold dinars in exchange for goods, and commodities. If this will be the end result of the production of Arab gold dinars, then there will definitely be a change in the world economy in the future. Since the price of gold is usually dictated by demand, then a lessening of the amount purchased will produce a significant effect on the price of gold in the international market. Although this might mean some possible disaster for some, it may a great boost for the failing Arab economy in the future. Aside from that, it will give them a type of identity in the area of gold coins. The 50 Dollar Gold Coin comes in a few different manifestations or varieties. One of the best ways to invest in gold is by buying gold coins. Gold coins are available in different weights and karats which determine how much a gold coin will cost. One of the easiest and most preferable ways of investing in a gold coin is by buying the largest amount of weight in the most comfortable unit possible. Buying greater weights of gold will actually lessen the amount of premium that you would need to pay for a gold item. Such premiums of course include the labor costs and the transportation and insurance costs which would entail the delivery of the coin. If you wish to cut back on these costs, the best thing that you can get is the 50 dollar coin. They contain one ounce of gold in a single coin thereby cutting down on the costs. You can get these coins in either the American Eagle coin or the American Buffalo coin. They all have a face value of fifty dollars though their real value is way worth more than that especially now that an ounce of gold is valued at more than $1,700. 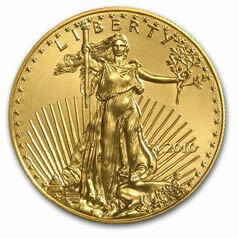 The American Eagle 50 dollar coin contains 1.0909 ounces of gold with a purity of 91.67% or 22 karats. This is a good investment if you are looking for a gold coin that is hard and will not easily be damaged by handling. It contains an alloy of copper and silver which contributes to its color and toughness. The excess weight gives you the exact one ounce of gold in the coin which is a good thing if you are looking for coins that really contain what their certificates say. It is one of the most popular coins in the world will easily be traded due to their renown. The $50 American Buffalo however is for the keener gold investor. It contains a purer type of gold which is 24 karat but one of the downsides to this is that it can be easily damaged when mishandled. So the type of coin that you may buy will depend on your preference with what type of gold you would like to have in store. Gold investing with coins is one of the most secure ways of storing your wealth for future use. The buying of this precious metal should however, be done with the wisest decisions in order to arrive at the best possible outcome for your investment. Not all types of gold items will give you the best rate of returns as they are all priced differently depending on the costs of production and also the design and other characteristics such as rarity and age which can all affect the price of gold. Although gold value is determined by its weight and karat, some factors such as historical value and design will affect how a gold item is priced by a seller. So, if you wish to invest in gold coins, you should understand the various factors which may come into play and act according to what your particular investment needs may be. Gold Coins are issued from the the People’s Republic of China official mint. They have two general coin types: the Chinese Panda and the Chinese Unicorn. The former is the more popular among the two and is the one which is usually sold or bought in the market. The Chinese Unicorn was issued on 1986 and has a limited mintage hence making it quite unpopular with gold coin collectors. It features the Chinese unicorn in its obverse and the unicorn of the West on its reverse. The Chinese unicorn is also made from high quality gold – 24 karat – and is being sold at a weight of a twentieth part of an ounce. The coin has a face value of five Yuan and can be bought in the United States in almost mint condition. The Chinese Panda is the most popular Chinese gold coin. They were first issued by the Chinese mint in 1982 and was always issued with a different figure of a panda each year. The trend was stopped however during 2001 and so both of those that were issued from 2001 and in 2002 contained the same Pandas. The variety of Pandas makes it a very collectible item and also its gold content. Proof types of this coin were only issued from 1986 to 1995 which makes them a rare commodity to come by. There is also another Chinese gold coin which is quite popular among collectors but it does not really look like a coin at all. It is the China Year of the Monkey coin which is molded like a fan. It weighs for one-half of an ounce and is also available in the United States. This coin features the Chinese monkey and also the year and place of mintage. Aside from them, the Chinese government also issued several other gold coins each depicting a different object and also a specific important event in history. In 1979, the Chinese Mint struck 13,000 pieces of a commemorative coin for the first anniversary of the International Children’s Year. It had a face value of 450 Yuan and is made from a lower karat of gold about 90%. The coin depicted two small children planting a tree. In 1993, the Peacock gold coin was issued with a fineness of 99.9% pure gold and with a face value of 100 Yuan. There is also the Endangered Wildlife gold coin which was released in 1994 that depicts the Chinese panda as an endangered animal. The coin has a 91.6% fineness and is made of eight grams of gold. In 1995, China issued the Dinosaur commemorative coin weighing one-half of an ounce. It is made from 24 karat gold and features the Wooden Pagoda in Shanxi in its obverse. The reverse of the coin carries the image of a dinosaur. The coin carried a face value of fifty Yuan and only two thousand pieces were struck for this issue. The last type of Chinese gold coin is the Guilin Scenery commemorative gold coin. It is rectangular in shape in contrast with the traditional type of coin and it showcases several famous landmarks of China such as the Flowery Bridge and the Elephant Trunk Hill in its obverse. It is also made from 24 karat gold and weighs one-half of an ounce. 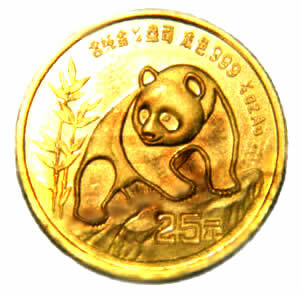 The Chinese panda coin is one of the most popular types of gold coins in the world. It is issued by the People’s Republic of China but it is available almost anywhere in the world. The coin was first issued in 1982 and they have been sold at several weights and in various depictions of the Chinese Panda making them one of the more highly valued gold coins to collect in the world. The first gold coin that was issued in China in bullion type, the Chinese Panda is available in several different weights – one, one-half, a quarter, and one-tenth of an ounce. The one-twentieth part of an ounce type of Chinese Panda was only added after a year. The designs of the Chinese Panda comes is a newer form every single year making them one of the most collectible item by numismatics. This was however prohibited by the Chinese government in 2001, making the 2001 and the 2002 issue similar in design. These coins are struck in different mints in China and they do not have any minting mark like those which can be found in gold coins in the US. What is does contain however, are the date of issuance, the face value and also the obverse design of the coin. The coin has the Temple of Heaven in its obverse and also the Chinese inscription of the People’s Republic of China. It also has the year of issuance and also the indication of whether it is a commemorative gold coin or the theme of the coin. The reverse side of the coin features the Chinese Panda which is different every single year. The success of this coin can only be seen in the amount of coins that were sold during the 1980s. It was widely used not just for gold coin collecting but also as embellishments in jewelries such as bracelets and earrings and also in earrings. The smaller sizes of the coins made them very versatile not just as an investment but also for accessories. The design of the panda was however halted in 2001 when the People’s Republic of China adopted a new policy but the ensuing clamor for the usual method – which is having a different design each year – brought the changing designs back in 2003. The coins are officially issued by the China Gold Coin Corporation and the official distributor in the US is the Panda America. The coins are used as a legal tender in China although the actual value of the coin exceeds its stated face value either 500, 100 or 25 Yuan. A one gram Chinese Panda was especially issued in 1991 to make the Chinese Panda more affordable for the public and had a face value of three Yuan. The size and dimensions of a Chinese Panda depends on the weight of the coin which can range from one ounce up to one-twentieth of an ounce. There were weightier coins that were issued but the standard one ounce coin has a diameter of 27 mm and a thickness of 1.85 mm. 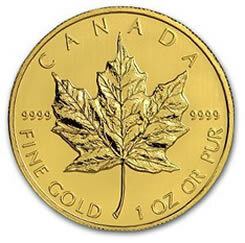 The Canadian Maple Leaf is the bullion coin of Canada and is issued by the Royal Canadian Mint. It was designed by Walter Ott and features the famous Canadian emblem on its obverse. It is made from either .999 gold or .9999 gold depending on the time on which the coin was issued. The later ones are made from the higher fineness as a sign of Canada’s higher standards in the production of gold coins. The coin is considered to be the purest type of gold coin that is available for collecting today. 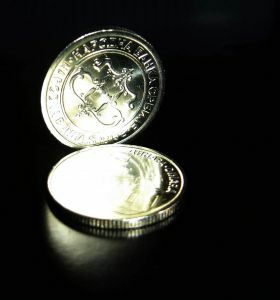 The coin was first issued in 1979 to compensate for the market for gold coins as the South African Krugerrand was prohibited from being sold for some political issues. However, it can be said to be different from the Krugerrand in that it is made from 24 karat gold unlike the 22 karat Krugerrand. The Canadian Maple Leaf is available in various weights ranging from one-twentieth of an ounce to one ounce. The face value of the coin starts from one Canadian dollar to fifty dollars but there is also a 1 kilogram coin which has a face value of one million dollars. In 1994 a one-fifteenth of an ounce coin was issued having a two dollar face value but it only came with a limited number of coins issued and were smaller in size which had made them valuable only as additions to jewelries. The coin proved to be not so popular hence the producing of the coin has been stopped. In 2007, the mint issued a 1-million dollar gold coin which has a purity of 99.999% gold and weighs about one kilogram. It was issued to promote the popularity of the Canadian Maple Leaf and only a few were able to purchase the coin. This was done to promote the newer type of Canadian gold coin which has a higher purity than the past coins that were issued by the mint. It was sold at the price of two-and-a-half million dollars to three million Canadian dollars. The coin was designed by Stanley Witten. The coin was manufactured with a .999 fineness of gold and was only changed to a .9999 purity in 1982. The purest that was ever produced, one having .99999 fineness was produced to commemorate special events and was particularly difficult to store and handle as it is very soft being pure gold. Most of the Canadian Maple Leafs that were issued from 2007 were usually designed by Stanley Witten and usually portrays Queen Elizabeth II on one of its sides. The coin is officially struck at the Ottawa branch of the Royal Canadian Mint. The high quality of gold that the coin possesses makes it very difficult to handle as it is more subject to being damaged by handling. This has been one of the drawbacks of having a gold coin in such a very high karat but if you are after the quality of the coin, this will not be such a big problem.